A couple of short-run fast food items from the days of yore took over the internet recently. There’s an entire podcast dedicated to the brief period of time McDonald’s served pizza, and thanks to Rick and Morty, people were suddenly obsessed with McDonald’s “Szechuan Sauce” that was served coinciding with the Disney movie Mulan. Of course, there was nothing authentic about Mickey D’s sauce, which had little if anything to do with Sichuan cuisine (For starters, the top-listed ingredient in their Szechuan Sauce was high fructose corn syrup). However, this confluence of events serves as a nice jumping off point to discuss some other short-lived fast food items we would like to see get another chance. First off, I just wanted to address the Bell Beefer, since it is a staple of internet clamoring for discontinued menu items. We don’t need the Bell Beefer back. It’s just a burger, only interesting for the novelty of getting a burger from Taco Bell. 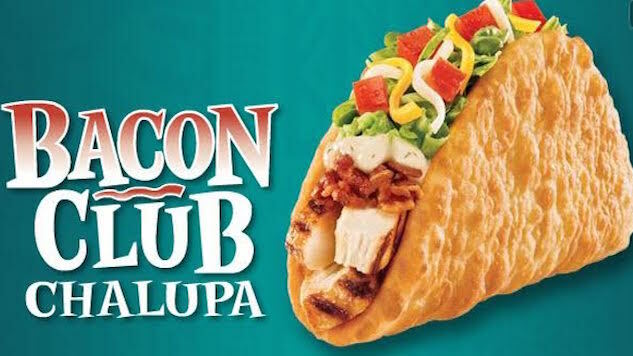 However, as I delved into writing this list, I was reminded of the existence of the Bacon Club Chalupa, and I was instantly taken back to my memories of eating these. It was good enough to pull me away from my traditional gordita eating. I didn’t like the chalupa shell nearly as much, but I was all about a taco that included chicken, bacon, and a tasty ranch sauce. When they brought it back in 2015 briefly, a time in which I did not partake in eating it again, apparently they made it an avocado ranch sauce. That sounds like an improvement. Jack in the Box is primarily a West Coast chain, which is why I spent much of my life unfamiliar with their menu. However, said menu is basically completely insane, and there was a period of time where their ads were literally solely catering to an audience of stoned people who wanted to eat weird stuff. The Cheesy Macaroni Bites aren’t that odd, to be fair. They were basically just deep-fried globs of macaroni and cheese. That’s something you don’t find at a lot of places, and it also is something a fast food place manages to do well. By the way, you can currently get a sandwich consisting of chicken, hash browns, bacon, cheese and ranch dressing on a croissant on their “Munchie Meal” menu. You know, if you are stoned and hungry. The Whopper is a solid burger. It’s not great, but it gets the job done, which makes it the perfect trademark burger for a fast food restaurant. The Western Whopper took that solid base, and added bacon (before bacon got played out) and sauce with a “Western” tang. Basically, it was BBQ sauce, but BBQ sauce is wonderful on a burger, especially when you throw in bacon as well. Sometimes, you aren’t in the mood for a traditional sandwich. In that instance, some fast food places now offer wraps, but what about a classic pita-style sandwich? Wendy’s released three pita sandwiches in the mid-90s: one veggie, one Chicken Caesar and one Classic Greek. The Greek was the best, although that may be influenced by a general lack of interest in Chicken Caesar Salad. The Greek one, though, had feta cheese, and it just makes sense to have a Greek sandwich on a pita. It was basically like eating a chicken gyro, and who doesn’t enjoy a chicken gyro? I had just moved to Los Angeles, and, naturally, I had gotten lost on my way home from a studio I was doing some work at. To try and alleviate my frustration, I decided to stop at a Subway to pick up a footlong of this new sandwich I had been seeing advertised. That sandwich was the Orchard Chicken Salad. In addition to the chicken, and the mayo, it had cranberries raisins, apples and celery. If they still had the Orchard Chicken Salad available, it would be my go to order. Instead, I’m pretty sure it only existed for a month or two that summer. These days, fast food pizza places trumpet the quality of their ingredients. Papa John’s has been doing the whole “Better ingredients, better pizza” thing for a while, and Dominos built an entire ad campaign on apologizing for how garbage their pizza had been. This is a good thing, but I occasionally feel a twinge of fondness for the days when pizza places were trumpeting quantity over quality. The king of that era was Pizza Hut’s Bigfoot Pizza. The Bigfoot was a rectangular pizza that was three feet long. Apparently, you could get it with three toppings for only $10.99 back in 1993. Rare are the occasions when you would need that much pizza, and you could always just order a couple normal size pizzas. Still, there’s something about seeing a delivery guy with a giant rectangular box. Look, if we’re being honest, the best thing about Taco Bell’s food is the melted cheese. The best item they ever introduced was the Cheesy Gordita Crunch, and the reason for that is the taste and mouthfeel of the melted cheese between the gordita wrap and the hard taco shell. The Cheesarito is basically just one big opportunity to enjoy some melted cheese. It was a soft tortilla stuffed with cheese and taco sauce. The Arch Deluxe was a burger for “adults,” an attempt to provide a “mature” option for people bringing their kids in to eat Happy Meals. This was apparently lost on me as a kid, because I ate several Arch Deluxes. It had a weird piece of circular bacon that was inorganic looking even by fast food standards, but maybe they could replace that with strips of peppered bacon if it were to return. One thing is for sure; the sauce they used for the Arch Deluxe was quite tasty, and it also had ketchup on it, which they wisely put on the bottom bun so it didn’t mix with the Arch Deluxe sauce. Look, the Enormous Omelet Sandwich was kind of repulsive. However, it was repulsive in that way fast food can be sometimes, which is to say it was gloriously repulsive. It was so big and so heavy, which is to say when you ate one it’d weigh on you. One sandwich was 730 calories and 47 grams of fat. It was a long sandwich, filled with eggs, an uncannily long sausage patty, bacon,and a ton of American cheese. It was almost a novelty sandwich, not something you could — or should — eat with any regularity. It’s also the kind of thing that is missing from modern fast food. 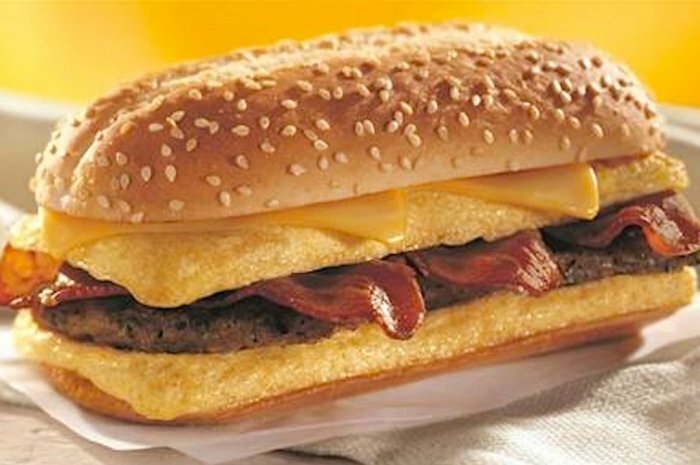 Give America the opportunity to shove a revolting among of breakfast food down their gullet in sandwich form again, BK! Not everything McDonald’s has done over the years has been a success, but a lot of things, like the McDLT, just didn’t make practical sense. I remember eating what I believe were bratwursts from Mickey D’s sometime around when I graduated from high school, for example. I thought about going with the Hula Burger, which was a meat-free Lent option built around a pineapple slice. Sure, I’ve never eaten it, but I’d like the chance. However, the Cheddar Melt is just a more practical, and more enticing, option. It had onions sautéed in teriyaki sauce (which make any burger better) and also it came on a rye bun. The Cheddar Melt was just different enough from McDonald’s traditional options to make it intriguing. It certainly deserves a return more than those Salad Shakers McDonald’s used to offer. We certainly don’t need to see the return of salad in a cup. Chris Morgan is the author of The Comic Galaxy of Mystery Science Theater 3000 and the new novel The Ash Heap of History. He’s also on Twitter.